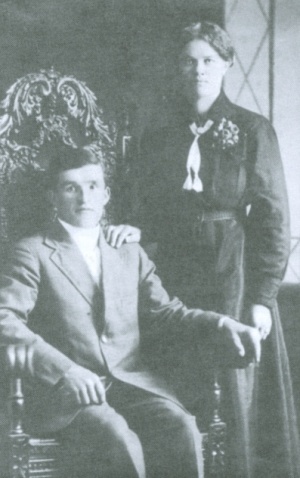 Peter S. Wiebe: teacher and elder; born in 1888 in Chortitz (later Randoph), Manitoba, Canada, to Johann Wiebe and Maria (Sawatzky) Wiebe, emigrants from Russia who had moved to Canada separately with their families in 1875. Peter was one of 12 children from his father’s second marriage. He was baptized on 31 May 1909 and joined the Chortitzer Church. On 26 November 1916, he married Justina Dyck, daughter of Abram Dyck and Louise (Wisznewski) Dyck of Eigengrund. The couple had nine children, several of whom died in childhood. Peter died after a long illness on 18 March 1970 in Chortitz. In his youth, Peter attended local schools before studying to become a teacher. After his marriage to Justina Dyck on 26 November 1916, Peter worked as a teacher in the confessional school in Chortitz for several years, teaching during the winter and farming in summer. The family lived in Bergthal for a year before moving to the Osterwick area, where Peter and Justina rented a farm and raised cows, pigs, and chickens. The family also grew during that time, as four daughters and two sons were born there. Wiebe became active in the local congregation, being elected auditor for the Waisenamt financial statements in 1928. The Chortitz church had recently lost about one third of its members when a large group of Mennonites, including the church’s former elder, Martin C. Friesen, immigrated to Paraguay in 1926 and 1927. Peter was elected minister and song leader of the church on 28 August 1930. On 29 October 1931, he was elected elder, or Ältester, and he was ordained on 16 March 1932. He remained in that position until his retirement in 1962. Peter’s new duties as Ältester took him all over the community as he did frequent home visitations, as well as baptisms, weddings, communion services, funerals, and other duties related to helping the church through its loss of members and the struggles of the Great Depression. Despite his busy schedule, Peter persisted through the difficult times, preaching, visiting, and holding Sunday School meetings for the youth. Although he was viewed as a strict leader in many ways, he was also appreciated for the sense of humor he brought to his dealings with people. While serving in the church, Peter supported himself and his family by continuing his work on the family farm in Eigengrund, as well as by opening a blacksmith shop in the community, keeping bees, doing carpentry work, and even making his own rope and leather. When the Second World War broke out and the threat of conscription became an issue, Wiebe joined a committee working to organize and manage alternative service programs for the young men of the church. He remained on the committee until close to the end of the war, when another minister replaced him. After the war, Wiebe helped his church through another two significant losses of members, one in 1948 when many families left for South America, and another in the 1950s when some of the Chortitz members left to form a new church. Peter continued to serve as a minister until the end of 1965, when he resigned because of failing health. He led his last worship service in Chortitz in the fall of 1969 and died at home on 18 March 1970. Peter S. Wiebe was a dedicated teacher and minister, committed to nurturing the members of his community, his family, and his church. He left a legacy of hard work and faithfulness for the generations coming after him to follow. Funk, Justina Wiebe. "Ältester Peter S. Wiebe 1888-1970: Servant of God." Preservings (December 2002): 79-87. Mennonite Heritage Centre. "Peter S. Wiebe Fonds." http://www.mennonitechurch.ca/programs/archives/holdings/papers/Wiebe,%20Peter%20S.%20fonds.htm (accessed 16 September 2009). Huebert, Susan. "Wiebe, Peter S. (1888-1970)." Global Anabaptist Mennonite Encyclopedia Online. 2009. Web. 25 Apr 2019. http://gameo.org/index.php?title=Wiebe,_Peter_S._(1888-1970)&oldid=96837. Huebert, Susan. (2009). Wiebe, Peter S. (1888-1970). Global Anabaptist Mennonite Encyclopedia Online. Retrieved 25 April 2019, from http://gameo.org/index.php?title=Wiebe,_Peter_S._(1888-1970)&oldid=96837.